The answer can be found in The Japanese Kitchen by Hiroko Shimbo. 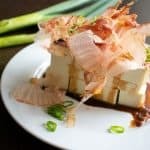 Kaeshi – A mixture of soy sauce, tamari, and sugar that is made a week ahead to let the flavors meld. Traditionalists require this melding time. Dashi – A fish broth made of bonito flakes, kelp, and water. These two items are then heated together with additional bonito flakes to make the final sauce. 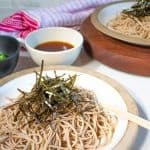 Goal: A homemade soba noodle dipping sauce that tastes better than a store bought version that is quick and easy to prepare. 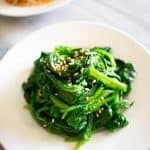 This recipe eliminates the time required for the traditional melding of soy sauces and dashi broths into a one-pot version that can be eaten the same day. Since mirin contains alcohol, it is simmered with water for about a minute to burn off the harsh alcohol flavor. You need the water to thin out the sauce. Then soy sauce and bonito are added. It should steep for about 10-15 minutes before straining and cooling completely. 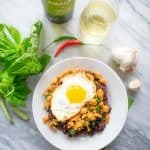 To make this vegan, you substitute a rich mushroom and kelp stock instead of water. Buckwheat, by itself, is not a grain. Since it doesn’t have gluten, it is difficult to stretch it into a noodle. 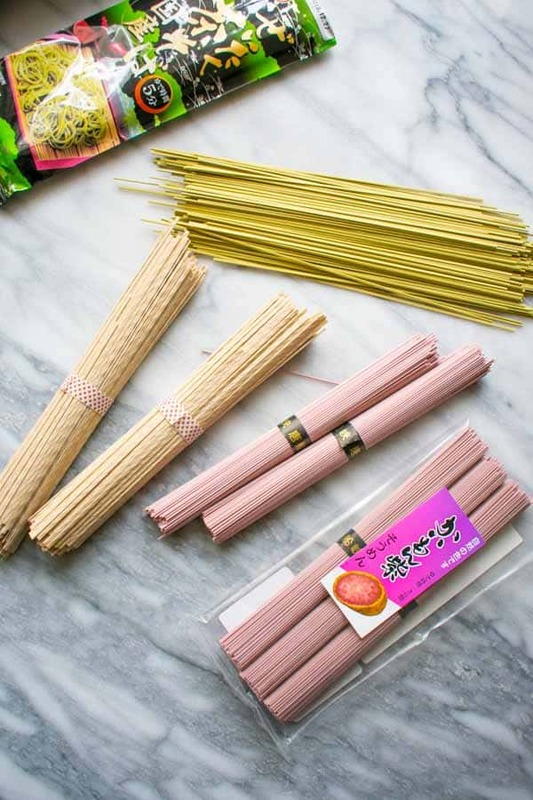 You can find 100% buckwheat soba noodles, however, many manufacturers will add some wheat or yam starch to make the dough pliable. This also results in a chewier noodle. Buckwheat flour is also more expensive so adding other starches makes it more economical to produce. More buckwheat flour will result in a darker, nuttier noodle, and you can compare the color of the noodles in different brands. 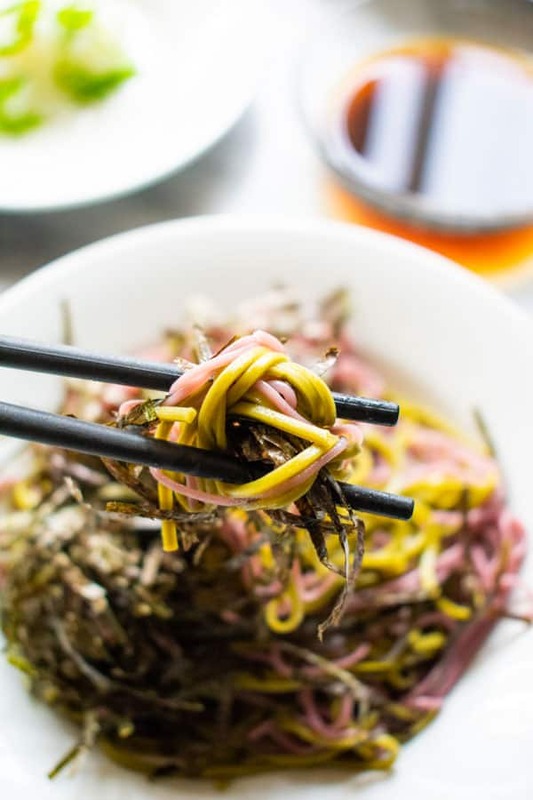 Soba noodles come in many other varieties besides buckwheat. There are green tea and purple yam varieties. Tri-color spaghetti anyone? 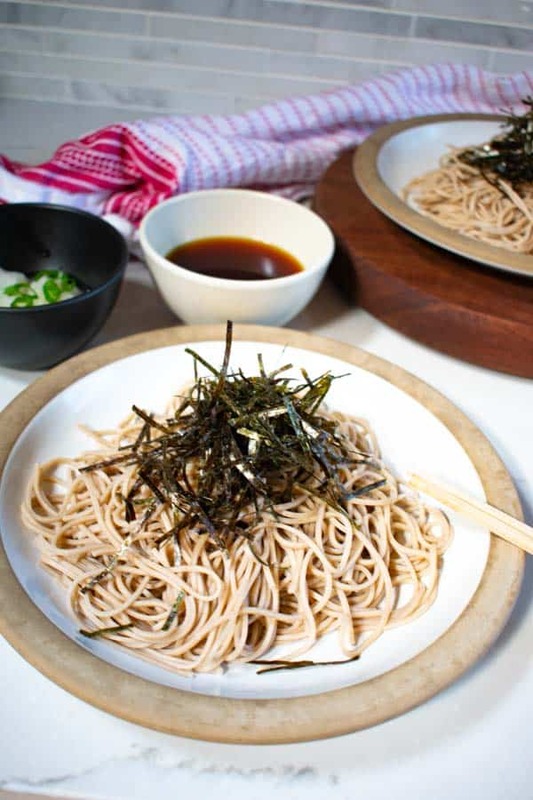 This cold soba noodle dish is eaten on special occasions such as New Year’s Eve. As in other Asian cultures, the long, thin noodles represent a long life with extended happiness. These end of year noodles are called “toshikoshi” soba, which means “cross the year” soba noodles. 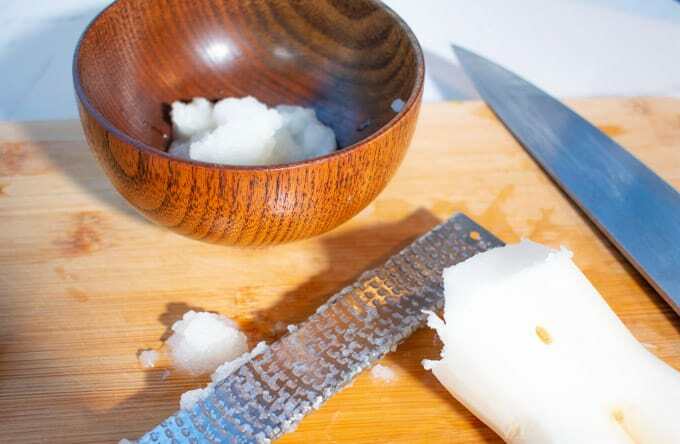 Grate daikon easily with a microplane grater. It achieves a fine texture that can be mixed into the dipping sauce bowl. Soba noodles should be cooked in about 4 times the volume of water than noodle. Cook according to the package directions, usually only 4-5 minutes. 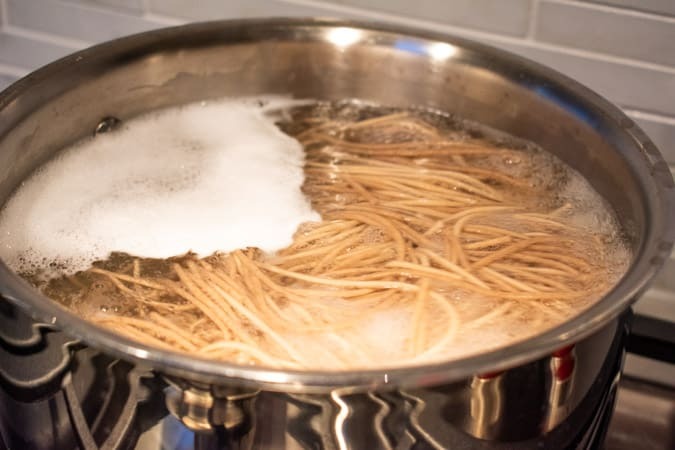 While many cooks would save the pasta cooking water for Italian pasta as part of the sauce, the cooking water from the soba noodles is actually saved and served in a tea pot. 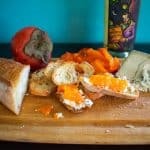 It can be drunk as “tea” or mixed into the leftover sauce bowl for soup. Run the soba noodles under cool running water with some ice if available. 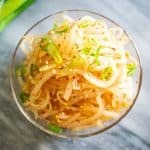 Because buckwheat does not contain gluten, the noodles don’t get so sticky and will remain separated. 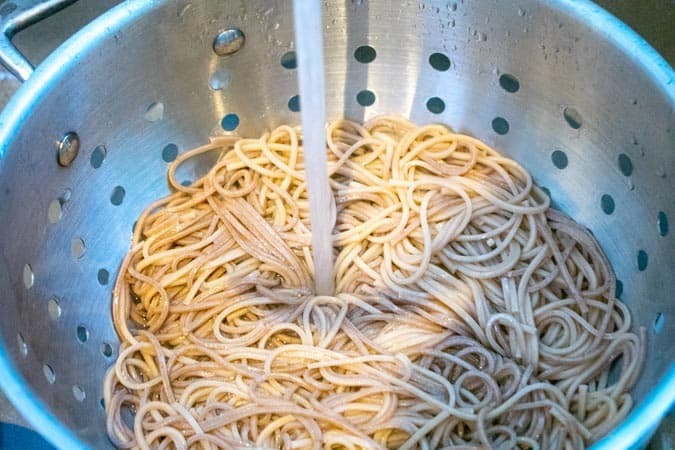 Because it contains less gluten than an Italian pasta, the soba will not get too sticky. You don’t need to add oil to the noodles to keep them from sticking. Instead, leave them to drain the colander and refresh with cold water to loosen before serving. They can also be left in the refrigerator for a few hours. The Chinese introduced buckwheat to Japan, and by the 8th century, Japan was growing buckwheat along with rice and millet. 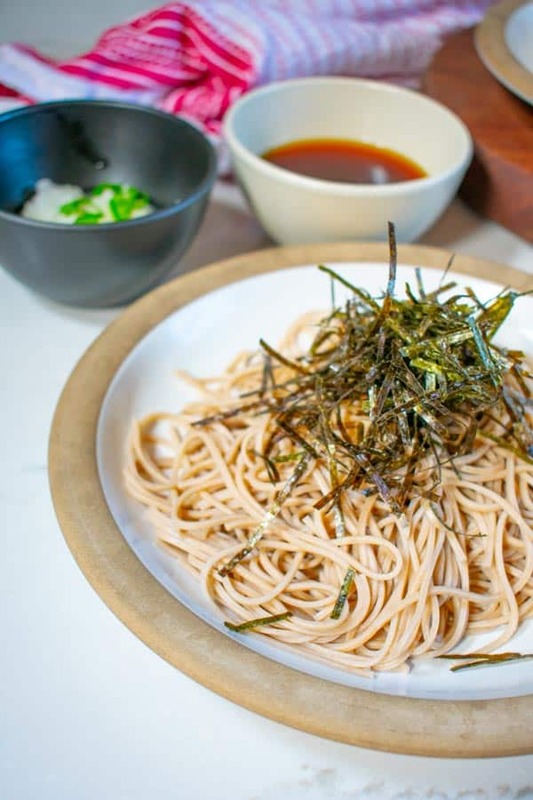 Buckwheat soba noodles first appeared in the late 16th century and have since become a fast food staple. Buckwheat soba noodles are favorite among the busy lunch time crowd in Japan. They are cold and can be slurped down quickly (and very loudly). Loud slurping is so common in Japan and not at all a sign of poor taste or manners. 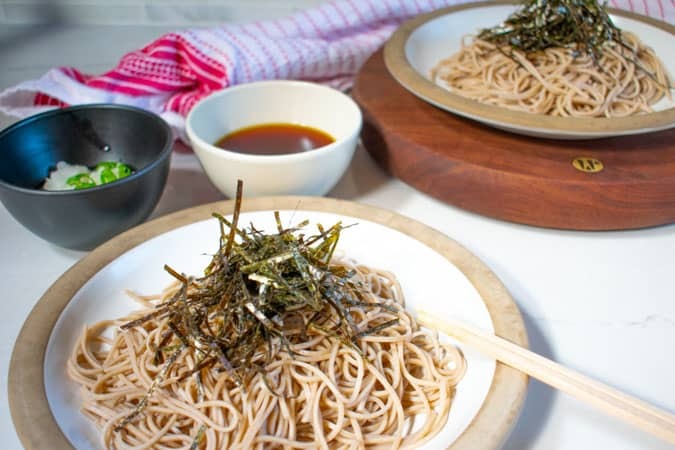 This recipe for soba noodles sauce is easy, fat free, and pairs with wonderfully healthy and nutritious buckwheat pasta. It should be in everyone’s repertoire for a quick lunch or special year end meal. Bring a pot of water to a boil. Add soba noodles and cook according to package directions, about 4-5 minutes. Drain and cool with cold running water or ice. Bring 1/2 c mirin and 1/2 c water to a boil. Simmer for 30 seconds to remove the alcohol. Turn off heat and add bonito flakes. Let sit for 10 minutes. Strain and add soy sauce. Serve noodles and dipping sauce in separate dishes. Add garnishes as desired. P.S. Do you love long life noodles? Please spread the Asian ♥ and share!